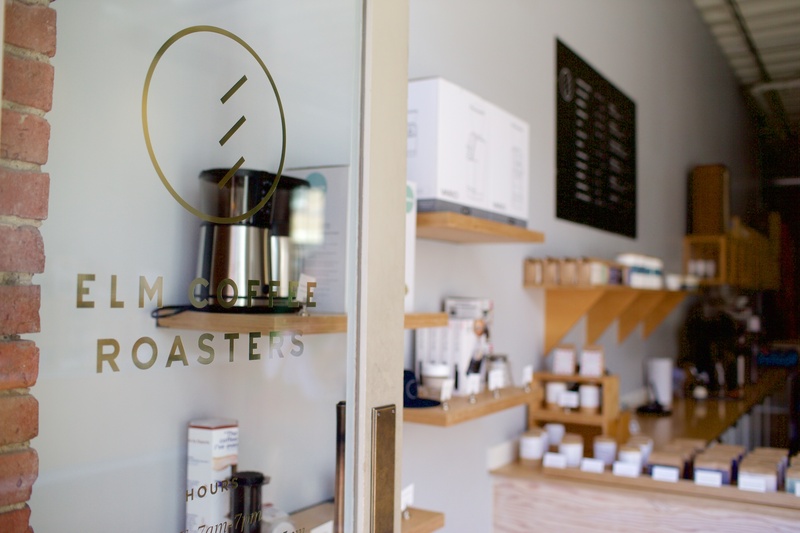 I believe it was about a year ago that I first heard about the Elm Coffee Roasters cafe opening up in Pioneer Square, and I made note to go down and check them out. If you’re like me, I tend to make note of things, and then put them off in typical procrastinator style. Fast forward to April 17, 2016 – a day which involved visits to three separate cafes (though, one of them closing about five minutes before we arrived). Filter coffee is served in a miniature caraffe. This was a juicy Ethiopian with notes of peach. 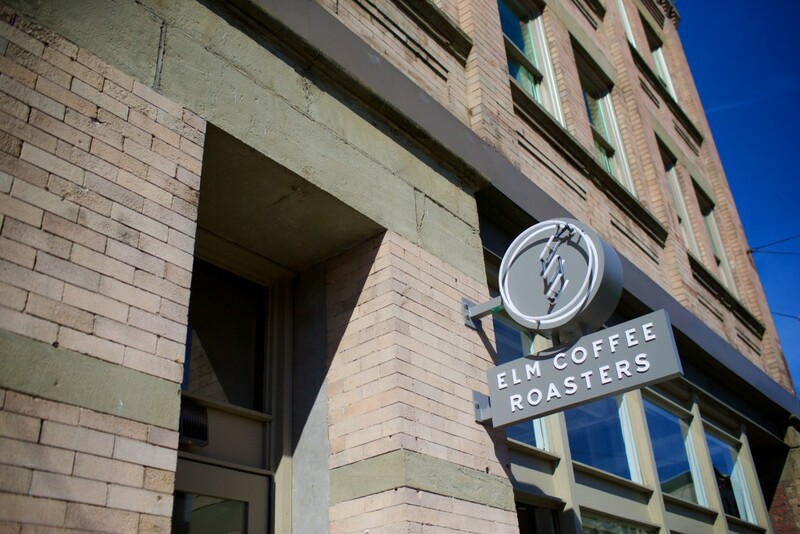 I wasn’t completely sure where Elm was located, but their on-street signage was easy to spot. It was unusually warm today in Seattle – in the high-70s, and so their door was open and the sun’s rays illuminating their beautiful cafe. The first thing I noticed was their collection of brewing equipment available for purchase, including the Baratza Vario, potentially one of my best purchases since I’ve started brewing coffee myself. After being welcomed into the cafe by their kind and delightful baristas, I placed my order for a single-origin espresso, which I was told was from Ethiopia. I asked about manual brew options, and found out that they prefer to highlight their single-origin offerings via batch filter brewing, and was kindly offered a sample. 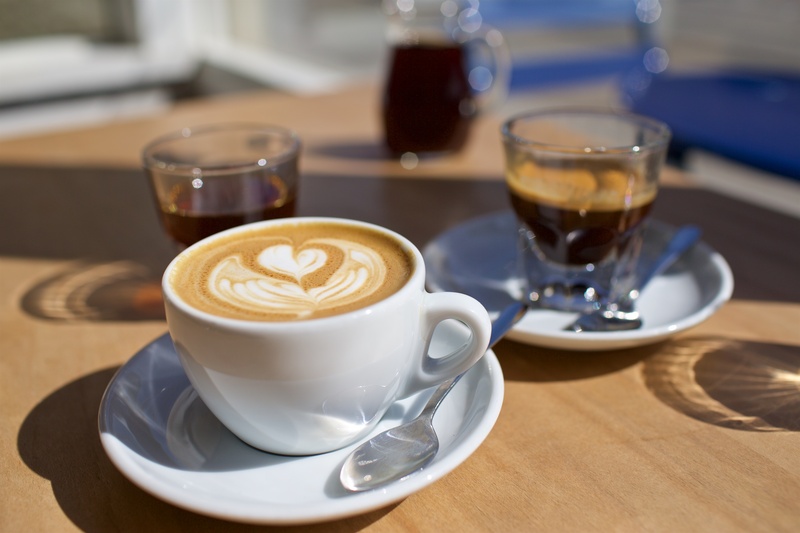 I decided to keep it simple and order a cappuccino with their Nine Swans blend, with which I was familiar, having enjoyed it at Street Bean in Belltown. Cappuccino, neat espresso, and filter batch brewed coffee bathed in natural light. 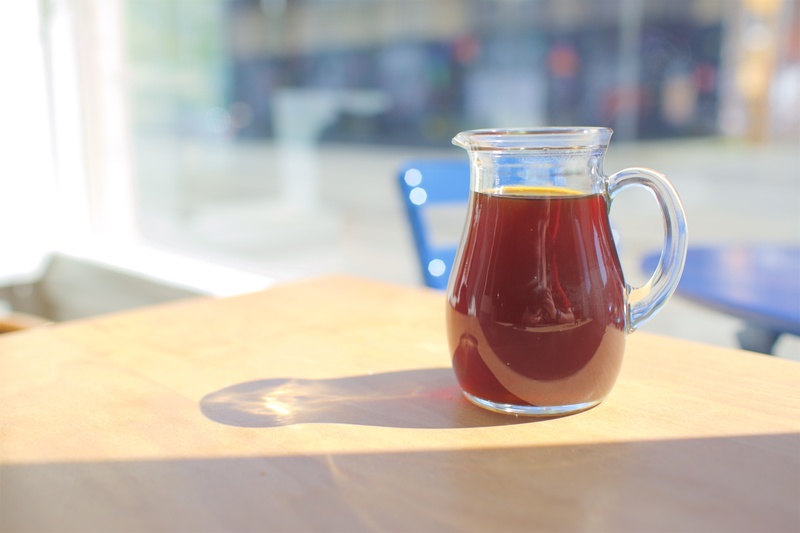 Their espresso had a lovely acidity and stone-fruit sweetness that lingered on the palette in a very pleasant way. That same flavour profile came through on the filter brewed sample. I had expected more notes of tea and citrus, but was pleasantly surprised with what tasted similar to a Kenya or Rwanda. Cappuccino was presented with lovely freepour artwork, and the espresso blend tasted very well balanced with the milk. 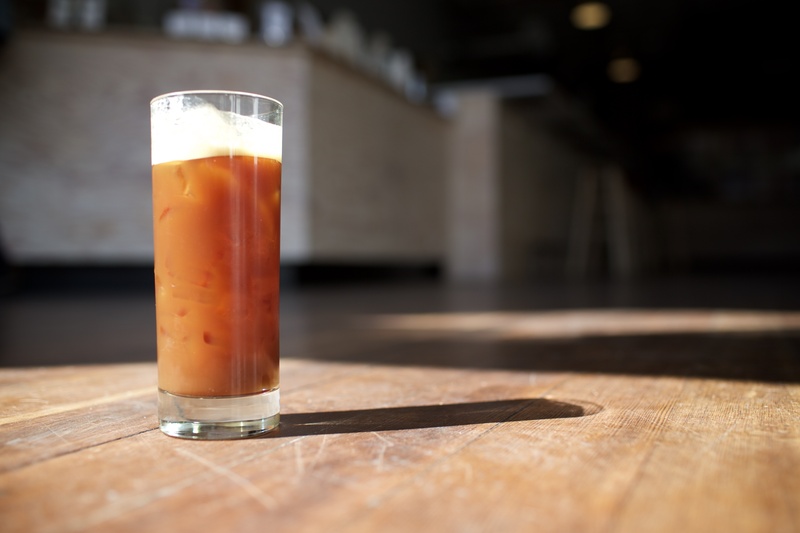 Espresso tonic marries a juice African single-origin espresso with tonic and quinine resulting in a concoction suitable for warm weather refreshment. If you get to Elm on a warm day, I *really* recommend ordering their espresso tonic. 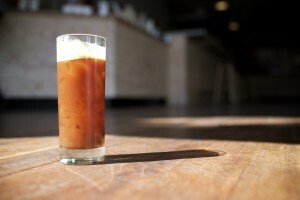 This is a very simple drink containing espresso and tonic – but is so refreshing. It’s almost like a sparkling fruit juice when you pair the tonic with a vibrant and sweet espresso like the Ethiopia I was served today (I figured that it would be on their web site, and I was avoiding the retail bags because my coffee drawer is already fully stocked). Unfortunately, I am not quite sure which coffee this is because their web site is featuring a Rwandan and a Colombian. The cafe tables were made of laminated plywood with exposed edges, which I only know because I was able to enjoy great conversation over a cup of coffee in a beautiful cafe. All said and done, I really enjoyed my visit to Elm today. 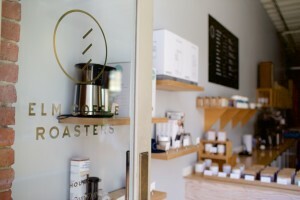 The retail shelf at Elm Coffee Roasters has a great selection of Baratza grinders, Aeropress, filters, and some of the best brewing gear available.